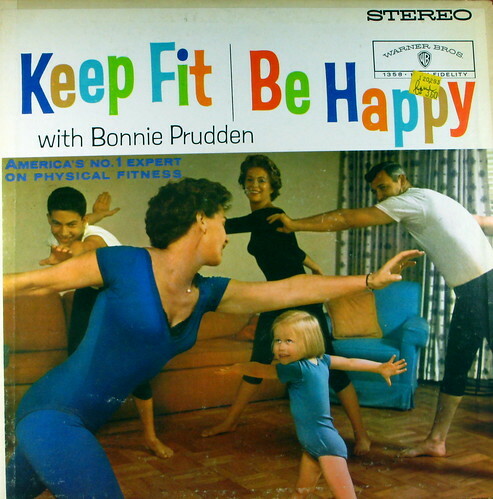 Keep Fit Be Happy, originally uploaded by kevindooley. I love to work out. If you follow me on Twitter or on Facebook, you know that I generally squeeze in a workout daily. I lead an intentionally busy, very scheduled life and still take 60 to 90 minutes from my day, every day, to give myself a mental health break and keep my body and heart fit. Why do I do I work out? 1. I am better able to deal with stress when I work out. Believe it or not, running Bramble Berry is not all puppy dogs and fun batches of soap. There can be times of intense stress. Physically moving my body and forcing myself to take a break improves my ability to handle stress.Want more information on how excercise reduces stress? There’s a comprehensive article about it here. 2. When I keep promises to myself, I am better able to keep promises to others. Each and every time I keep my promises to myself, I increase my willpower muscle. Did you know that willpower is a muscle? It strengthens and weakens with use or disuse. You can increase your self-regulatory muscle by working at it. Wouldn’t you like to be able to resist that chocolate cupcake? You can do it more easily if you’ve worked out your self-discipline muscle by working out consistently. Want more information about willpower? Here are two articles about it – one – two. 3. Exercise will help me live a longer life with better quality. A study showed that frequent exercise allowed you to live 12.7 extra healthy years of life (study here). I will be able to easy chase after grandchildren when I’m 70 if I keep up my exercise routine and God-willing, live disability free until I’m 80ish. While the idea of 80 is far off for me, I always begin everything with the end in mind (a la Covey) and my goal is to design my life *now* to live, disability-free, to 80 and beyond. More information on living to 80 and beyond and the link to exercise here. 4. Exercise increases energy. It’s a proven fact. My days and weeks are hectic feats of herculean balancing acts and frequently last 12 hours or longer for active thinking and work. If I work out daily, I am able to more easily handle the long days and knock it out of the park on shorter days. More information on exercise and how it fights fatigue here. 5. Exercise helps me fit into clothes I like. Eating a healthy diet helps with that too but on average, I can eat an extra 300 to 400 calories per day because I work out. That, my friends, is one cupcake or two glasses of wine. Or, if you’re trying to lose weight, that, my friends, is 1 pound every 10 days if you keep within your calorie guidelines. Do you work out? Why do you work out? I’d love to hear what you do for fun workouts. I’m planning to do another blog post this week on how to stay motivated for the daily effort it takes to fit workouts in. Previous Post: But, I Can’t Do That! Wow! I finally just got to go see her site. It’s incredible! And she is very inspiring. I’m not sure I could actually get through one of her workouts =)) I will try one of these days though! I am obsessed with Zumba right now, this salsa-type aerobics class in town. I am a total klutz in the class but so so so happy. I have a huge grin while tripping over my own feet. Beverly, I have the same problem. There is so much reward (ding, ding, ding!) with checking things off my To-Do list, answering one more email, writing one more blog post, doing one more comment on FB that the intangible of working out is sometimes hard to imagine. I completely empathize. =) Just try one more day in there – you can do it! Set a goal, get yourself an accountability group and you’ll be working out 4 days a week in no time. 44 Marathons? Are you kidding me? WOW! My hero for the week. That is awesome! Go Perry! I’ve never done rebounding and I totally want to. Every time I see a mini-trampoline on Craigslist, I am tempted … so tempted. I will totally bend your ear about Holistic Nutrition; I would love to learn more. I also was a no-tv kid and I think that really helped me out health wise (and brain wise!). You know- I did do Pilates for about 2 years, then we moved, and now finding a well trained instructor (I’m wary of the “weekend course” certifications”) at a studio I can afford is difficult. My yoga studio does hot pilates- but pilates was always such a challenge I don’t think I could handle the heat yet. I can do pilates at home, but I’m so out of shape now I think I’d need an instructor to correct me at least while I get back into it. Still it would be very good to get back into it- you’re right it’s zero impact and it while I never noticed a difference in abs, I did remember seeing a difference in my back. I didn’t ‘like’ working out for probably the first 10 years? I did it so I could fit into my clothes easily (honestly) but as I’ve gotten it programmed into my head, I look forward to my work outs. My staff will often prod me to get on the treadmill or go work out. They can tell when I haven’t worked out (guess I’m a bit more crabby!). Good for you to make time for it – especially with twin boys. I know it’s a struggle when you have little ones and I am extremely sympathetic. It’s important to just to what you can and quit beating yourself up for what you can’t. For now, concentrate on appreciating yourself for what you are able to do and work on beefing up that home practice. =) You can do yoga, mat pilates and even some of the great Jillian Michaels videos at home. I’ve also done a bunch of the Crunch ‘spot toning’ videos at home and liked them too. My “Day Job” is managing a storage site where we get free use of a unit. I packed mine with exercise equipment. Throughout the day (when breaks & lunch roll around) I run out there and get 10-15 min workouts in! I live onsite so my gym is always a few feet away! It certainly helps with keeping up with 3 boys, 1 boyfriend, 1 job, 1 fast growing company & 2 spoiled cats! I take a workout class, its a mix of pilates, gi kong, balance ball, yoga and dance moves, its semi private and its totaly the best hour of my week. I am so addicted to the endorphins – I feel incredible when I’m done with a workout but man, sometimes getting there is tough. You really have powerful motivation with your health factors playing into things. Kudos to you for making your health a priority. Love walking! And LOVE high energy RUMBA with fun music! That was very MOTIVATING!!! I try to work out at least 3 days a week. I feel so much better when I do my cardio, weights and yoga! Starting a small business isn’t easy. I work out of my home, so I should be working out at least 5 days a week, the hardest part is pulling myself away from the computer and getting in the workout room. Once I do, I feel really good!! I love your web site and products! I just like how it feels and I like to have a goal. I’m on a running streak (going for 1001 days in a row) and also have a goal to do 44 marathons. Just did #30 on Saturday. There are lots of pluses to working out. You named a bunch of them but you missed this one. It’s good for your brain. I love this post Anne-Marie! I too “schedule” time daily to workout, usually to run…but in the event that I cannot run, I do other types of exercise like hiking, rebounding (jumping on a mini-trampoline), rock-scrambling (I’m looking to try rock climbing soon), yoga, pilates, playing with my niece….or like this weekend, participated with my mom’s team of nurses in the Akron MS Walk. I exercise so I can feel strong, confident in myself, healthy and as a method of relieving the stress of owning and operating my own business. I also enjoy eating what I like while still fitting into my clothes. My formal education is in Holistic Nutrition, so it’s also nearly impossible to preach it if you don’t live it. I always felt lucky to grow up with parents who encouraged us to “play outside”, hike and explore nature. As a matter of fact, our TV got no channels until I was nearly 16 years old and rented movies were a “treat”. Since we grew up on a farm, we grew or produced nearly all of our own food. Living and working in a city as an adult forced me to reassess my lifestyle and make conscious decisions about my health. As a result, I don’t look at working out as a chore…it’s just something I do because I recognize it is a critical part of my life if I want to remain healthy. Great post A-M, I just started working out regularly! I have 3 yr old twin boys and I have found that I actually look forward to my time at the gym (YMCA has a babysitting room-yay!). We joined last month. Aw, you’re sweet. Erin, you are such a dynamo and an inspiration to many through your nutrition tweets and blog. =) I will try out Rodney Yee yoga videos as well. Thanks for that hint. Thank you for the inspiration. I like working out it helps me to focus and get motivated. I really have enjoyed the pilates class I have been taking as well as running on the treadmill. I wish I could go to the gym more than I currently do. I have been trying so hard to build a routine this last year but I find it can be exhausting dragging my two boys 5 and 1 to the gym. Every time I get back into going they pick up a cold from the gym daycare and I have to start all over again once they are well. I know it will become easier as the littlest one gets older. Just not sure how I can balance out workouts until then. I work out most days of the week. My Dad died of a heart attack 2 weeks after his 60th birthday…I just turned 60 myself. I am also a breast cancer survivor, and I know that physical activity reduces the likihood of a repeat appearance. I hate going in to the gym, but I am happy, happy, happy afterwards. Those endorphins and the idea that I just did something great for myself. Jessi, I am a good friend of Anne Marie’s and I haev trouble keeping up with her pace! She’s inspiring! I do yoga at home as I also have a hard time getting to the studio multiple times a week. I travel A LOT. Try any yoga videos with Rodney Yee, wonderful music, nature background and he’s not too hard on the eyes if you know what I mean! I balence my calorie intake with my activity level and try to at the very least spend 1 minutes doing 3 yoga poses each day. Yay! If you’re on Twitter, join the #FITCEOS hash tag group so we can all support eachother to work out every day. Kari – 1 hour on the treadmill = one guilt free decadent, luscious cupcake. After reading some of the posts, I have no excuse. Just need to get it done. I’ve recently gotten back to exercising regularly. It occurred to me that while I may think that putting my own needs AFTER the needs of my family and my business is valiant and selfless, it’s really self-defeating. I just FEEL better about everything in general when I get some exercise in. Right now it’s fast walking (running hurts my knees, too) but I’m going to be adding some Pilates in there, too (the focused breathing clears my head). And when I think that I can’t find the time to exercise, I take a page from your book and remind myself that it’s not “can’t”, it’s “won’t”. And then I just do it. Wow. Did you say 6 kids? (gulp) You are my hero! Six kids and you still get a workout in AND run your business? You, my dear, should write ME a guest blog about how you fit it all in. I am impressed. PS – Totally right about the oxygen thing. Really interesting and inspiring to think about will power being a muscle too. OMG – I think we had that Bonnie Prudden! It is SO FAMILIAR! I love running because it’s so calorically efficient – meaning, it burns more than almost any other type of exercise you can do. Hellooooo efficiency! I love efficiency so running and me are friends. I do get knee pain though so I can only do it 1-2x per week. I am loving Zumba lately – obsessed with it really. I look a bit like a spastic chicken but it is so much fun. Can’t wait to run with you at the Soap Guild show! Have you tried Pilates yet? I try and take a mat class (though for a year splurged on group equipment classes which were semi private) every week. It’s zero impact and all about core and stretching which is wonderful for knee, ankle, hip issues. My favorite home yoga tapes are the Sara Ivanhoe ones. http://www.amazon.com/Sara-Iva… They are 20 minutes so not enough time for me to be totally bored! I agree though, it’s hard to force myself to do yoga at home too. One thing I am doing with yoga is taking classes at two yoga studios. They’re both the same price so that way, I am able to pick and choose from two schedules. That really helps. Balancing my business and family of eight DEMANDS that I work out so that I can continue to serve at the level I desire. I love the analogy of the oxygen on a airplane. Think of the stewardess standing there always explaining to Moms to put their mask on first in case of emergency so that they can assist their young children. Women have such a desire to do many things and if we REMEMBER to put on our own oxygen mask we have so much more potential to serve at a deeper level. Exercising IS my oxygen. My kids recognize the difference and will remind me on days that it seems nearly impossible to fit it in. I love this post! You have been such a help and inspiration to me as I have slowly and with great intention incorporated working out into my daily schedule. A lot of people tell me to slow down, give myself a break — I agree that I can’t go too fast, but I’m not sure I agree that I need a break just because I workout each day. If anything, I think we need breaks from not working out — and lots of them. I feel great since starting my running routine (again), thanks to you for the Christmas pedometer surprise too! My favorite thing to do is to run. I am planning to add weight lifting soon. I was going to do it in May, but I think I had better do more planning and gearing up so I will start in May, but will actually incorporate it into my schedule in June. I feel better than ever now that I’m running almost daily. Thanks for the pep talk and reminder, and for the hilarious album cover. For the past few years I have been ice skating, but the recent hip problems have put an end to that. I LOVED the ice skating. I even took the tests to pass through a few of the most basic levels and entered a competition. I had planned to go to “Adult Nationals” this year, but then I got hurt. My favorite aerobics was step aerobics- I used it as my PE credits in college and now have my own step, but bad knees have put an end to that. As a kid I like bicycle riding, but as an adult I’m too scared to go down hills- it’s just too fast. I’m not a fan of swimming, and running is out of the question due to my ankles. I’m doing hot yoga now- but I can only make the studio’s schedule once a week. I should do at home non-hot yoga, but I haven’t found a tape that isn’t “boring”. I used to do a balance ball workout, but fell out of routine- I really ought to start that again. I’m interested to hear what other people do as exercise. I like your point of view on it- and it’s definetly a must. The lack of exercise in my life has changed my body A LOT the past 5 years and especially the past year, and I’m not happy about it.